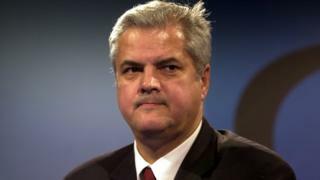 Romania's supreme court has sentenced former Prime Minister Adrian Nastase to four years in prison for taking bribes. He was also given three years for blackmail, to run concurrently. The court found that two Romanian officials had helped Nastase to get Chinese goods for private properties in 2001-2004. His wife Dana Nastase got a three-year suspended sentence for collusion. Adrian Nastase survived a suicide attempt in 2012, just after getting a two-year jail term in a separate case. In the ruling on Monday the court found that Nastase, 63, had received Chinese building materials and furnishings worth 630,000 euros (£521,000; $856,000) from a construction entrepreneur, Irina Jianu. In return, he had appointed her head of the State Construction Inspectorate. Jianu is already in prison, having been found guilty in the previous corruption case involving Nastase. The former prime minister left prison only 10 months ago, after serving two-thirds of his previous two-year sentence for corruption. Nastase was also found guilty of having blackmailed a former Romanian consul in Shanghai, Ioan Paun, in connection with the Chinese shopping spree. Nastase denies wrongdoing, saying the cases against him were politically motivated. Romania joined the EU in 2007 and remains under special monitoring by Brussels because of EU concerns about high-level corruption.